In this lesson, students will learn the vocabulary for points, lines, planes, and angles that they will use for the rest of the school year. • Warm-Up - The warm-up is an algebra review of solving equations. • Guided Notes - Two versions are included: mostly complete and fill-in-the-blank. The notes are 3 pages long. Examples are included throughout. • Homework - The homework is 1 page and 23 questions. • Answer Keys - Completely worked out answer keys are included. This is a lesson from Unit 1 - Introduction to Geometry in my Geometry curriculum. 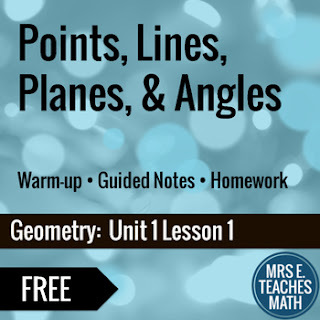 My Geometry Basics Activity Bundle has activities that can be used throughout the unit.